There are few knitting magazines devoted to a brand of yarn, but Noro Yarn is special, with colors in long repeats reflecting breathtaking color transitions in the finished piece. In the premiere issue of Noro Magazine, the reader is introduced to Eisaku Noro, who founded the company over 40 years ago in Ichinomiya, a town in Central Japan, which is a part of the country renowned for yarn and textile manufacturing. 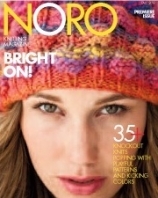 Now to numbers for you knitters: there are over 30 patterns in the first issue, ranging from sweaters, vests, hats, socks, slippers, and gloves using a variety of Noro brand yarns. The level of knitting experience needed for each project (easy, intermediate, and experienced) is indicated on each pattern. One may think all you can do with a yarn where the colorway is so prominent is to knit stockinette stitch, but these patterns disprove that notion, with cables, lace, shell stitch, miters, and texture stitches, such as seed and trinity stitch, being featured. In addition to patterns, the articles appeal to a multigenerational knitting audience, ranging from a history of the company to “Noro On the Web,” along with news on knitting apps, and an interview with tea-cozy designer and sculptress, Loani Prior. Subscription information about the magazine may be found on their website.